PHOENIX — The Governor’s Office and a leading Republican lawmaker are taking action after an ABC15 investigative documentary exposed widespread issues with the way state health boards handle cases of medical impostors. Gov. Doug Ducey issued an executive order directing the state’s nearly two dozen health boards to “identify and execute opportunities” to fix how they handle impostor complaints and deliver a written plan to his office by the end of May. In a separate move, Rep. Nancy Barto, chair of the Health and Human Services Committee, introduced House Bill 2118 this week. The bill directly addresses many of the flaws identified in ABC15’s reporting. HB2118 would mandate the state’s nearly two dozen health boards to take responsibility for impostor cases and sets specific rules for how they handle, document, and report the cases. It would also require health boards to publicly post the names of impostors. 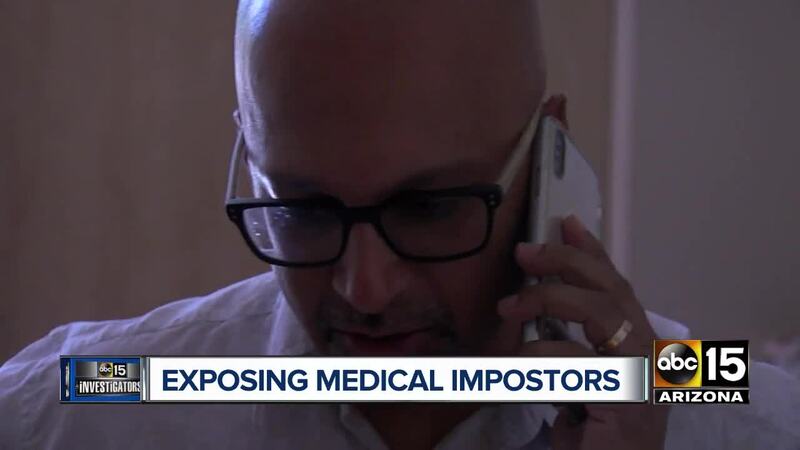 In mid-December, ABC15 launched “Impostors”, a six-part documentary series , that reveals how an incompetent, impotent, and indifferent system lets medical fakes run free and puts the public at risk. Regulate the unauthorized practice of the health field the board oversees. Verify complaints of unlicensed practice. Retain all records of the complaint and documentation for 10 years. Post on boards’ public websites, the names of people who have engaged in unauthorized practice. Set the criminal penalty for unauthorized practice to a class 5 felony. Refer verified complaints to county attorneys or the Attorney General’s Office. ABC15 has spent more than two years investigating impostor health professionals. In all, the station found there have been more than 130 individuals officially questioned, accused, and/or found to have participated in unlicensed practice of health since mid-2012. But in many of those cases health boards turned people away who had information about impostors, refused to investigate, purged documentation after months or a few years, failed to notify law enforcement, and kept names and information hidden from the public. Only two boards publicly list the names of impostors: the Nursing and Acupuncture boards. The first two episodes of “Impostors” will air in a special ABC15 report on Saturday, January 19th. All six episodes of “Impostors” are available now on the ABC15 channel on the following streaming devices: Roku, AndroidTV, AppleTV, Amazon Fire.